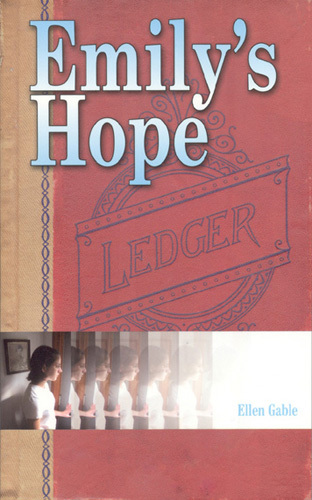 Listed below is an interview My Catholic Blog held recently with Ellen Gable Hrkach, the author of “Emily’s Hope” and “In Name Only“. We were very grateful that Ellen was able to spend some time answering a few questions for us, and we are very pleased to share the interview with you. For more information on Ellen Gable Hrkach’s books, simply click on the book images. Ellen, you cover a LOT of pertinent, relevant topics for 2010 in these books. In your book, “In Name Only” you seem to have a terrific grasp of historical settings. Tell us, were you a history student? 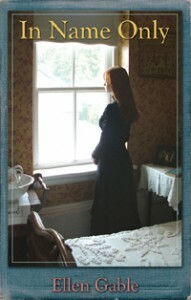 Why did you choose 1870 Philadelphia as the setting for this story? I was not a history student but I have always loved history. In particular, I find Victorian history fascinating because it was during this period that history was able to be captured photographically. I have a book on the Centennial Exhibition of 1876 (which took place in Philadelphia) with many photos. Several years ago, I was daydreaming about attending the exhibition and what it must have been like in 1870’s Philly. I thought it would make an interesting setting for a fictional story so I quickly jotted down an outline and within a year or so completed my first draft. OK. Now, in Emily’s Hope, topics range from marriage today, difficult choices to be made, dealing with society issues, family relations, families. Can you share with us the feelings of fear and grief you started writing about in your journal years ago? I began writing in a journal years ago after I experienced my third miscarriage. I naively thought that if my husband and I were open to life, then God would automatically give us as many children as we wanted. At the time, we already had two sons, but we felt called to have more. I was grieving and at times, I needed to talk (like in the middle of the night) and didn’t want to disturb anyone (least of all, my husband). So I began jotting down my thoughts and feelings. I did have a fear of having more miscarriages and there was part of me that didn’t want to try for another pregnancy because of the fear of possible miscarriage. But I knew I needed to trust that God knew what He was doing. We are now blessed with five wonderful sons ages 11-23. Ellen, would you encourage others to write down (electronically or in longhand) their fears and worries? Can you explain how this process helps accomplish settling your mind and setting aside worries, fears? Yes, I would encourage others to write down their feelings, fears and worries. For me, writing in a journal was like talking to a friend, and sometimes it was like talking to God. My notes eventually became somewhat of a prayer journal. That, combined with sitting in front of the Blessed Sacrament, helped me to grieve and heal and to be able to trust that God knew what He was doing and to stop trying to control every little thing that went on in my life. Sometimes, just the process of jotting down my feelings helped me to see things in a different light. You have been busy. Congratulations on the recognition you have received for your work! But there is (apparently) more to Ellen Gable Hrkach. What is next? Thank you so much. I am working on five different books to be published in the next few years by my publishing company, Full Quiver Publishing. The first is my third Catholic novel called Stealing Jenny. The second is called Come My Beloved: Inspiring Stories of Catholic Courtship. The third is a book I’m editing for parents written by Carolyn Smith. The fourth is an NFP Devotional Book. The fifth is a sequel to my historical novel, In Name Only. In the midst of it all, I homeschool my two youngest sons and my husband and I teach NFP, lecture at Marriage Prep courses in our Diocese and do chastity talks for young people. Tell us about the Family Life cartoons, Catholic Mom and Amazing Catechists. And, by the way, you have a very impressive blog! I enjoyed the post about how you explain pronouncing your last name (her-cash)! 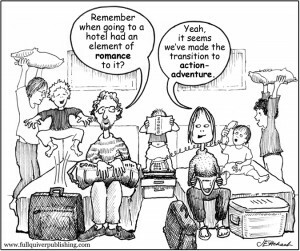 The Family Life cartoon currently appears in Family Foundations magazine and on the Amazing Catechists website. It is a cartoon which is based on our own family life with caricatures of us and our children. My husband is the artistic genius and I am the writer, the one who comes up with the ideas for the cartoon. Amazing Catechists is an incredible resource for Catholic catechists. I write a column called “Sexually Speaking,” which discusses and explains Theology of the Body issues. I do a similar column over at Catholic Mom as well. Did you think — twenty years ago — you would be here now? Is this what you imagined, and how has God helped shaped your path? Although I have been doing freelance writing for 15 years, I never envisioned myself as a novelist. In early 2001, after having an experience in front of the Blessed Sacrament, I came home and told my husband and he suggested that I write a novel based on my life and my great-grandmother’s life. After writing my first book, I soon felt called to continue writing novels, especially novels with a strong moral message. Ellen, may God bless you and thank you for a terrific interview! You’re very welcome! I appreciate the opportunity! Previous ArticleUpcoming: Author Interviews and Book Reviews! Great interview….Ellen sounds like quite the busy lady! God Bless you for your work for God’s kingdom! !